As part of e-governance initiative to facilitate conduct of assessment proceedings electronically, Income-tax Dept. has launched 'E-Proceeding' facility. Under this initiative, CBDT has made it mandatory for the tax officers to take recourse of electronic communications for all limited and complete scrutiny. In June, 2017, CBDT had issued the formats for issuing a notice to the taxpayers for conducting the scrutiny assessments. Now, CBDT issues an instruction for conducting the scrutiny assessments electronically. As per the instruction, except search related assessments, all scrutiny assessments shall be conducted only through the 'E-Proceeding' functionality available at e-filing website of Income-tax Department. Through this instruction, the Board has laid down the procedures to be followed by the tax officers to conduct the scrutiny assessment electronically. 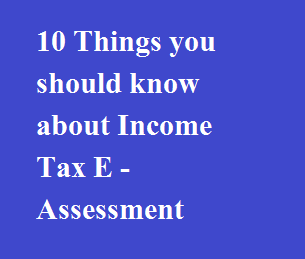 Ten-things to know about this instruction and e-Proceeding facility of Income-tax Dept. are as under. All the communications with the taxpayers shall be signed digitally by the tax officer and it will be delivered to a taxpayer in his e-filling account. On receipt of Dept. communication, taxpayer would be able to submit the response along with the attachments by uploading the same on e-filing portal. All the submissions and replies should be made by the taxpayer till office hours on the date stipulated for compliance. The response submitted by the taxpayer can be viewed by the concerned tax officer electronically in Income-tax Business Application (ITBA) Module. The facility for electronic submission of documents shall be automatically closed 7 days before the time barring date. Upon conclusion of hearing in assessment proceedings but before passing the final order, the concerned tax officer shall close the e-submission facility. Not all proceedings shall be carried out electronically. A few proceedings can also take place manually, i.e., examining the books of accounts, examination of witness, etc. The case-records and note sheets of proceedings is required to be maintained by the tax officer electronically. This electronic proceedings shall be carried out by the tax officers for Limited Scrutiny (in case of CASS1), Complete Scrutiny (in case of CASS) and Compulsory Manual Scrutiny. The taxpayer friendly measure would substantially reduce the compliance burden for the taxpayers as it would enable them to submit response to the Departmental queries electronically as per their convenience.